The Falcon 1 booster redeemed itself Sunday with an electrifying launch that put an exclamation point on six years of hard work and disappointment for SpaceX, a startup company chartered to revolutionize space travel. The 70-foot-tall rocket successfully delivered a 364-pound hunk of aluminum nicknamed "Ratsat" to orbit on the launcher's fourth flight, ending a streak of three consecutive Falcon 1 failures dating back to 2006. "That was freakin' awesome," said Elon Musk, founder, CEO and chief technology officer of Space Technologies Corp.
Musk established SpaceX in 2002 and funded the company from the fortune he earned selling Zip2 and PayPal, his earlier startups. "It's great to have this giant monkey off my back," Musk said. "It's been six years of extremely intense effort and some pretty heart-wrenching episodes during prior launches. The emotion I feel is much more relief than elation." Musk estimates he has invested about $100 million of his own money into the development of the Falcon 1 rocket. "SpaceX has designed and developed this vehicle from the ground up from a blank sheet of paper," said Max Vozoff, a mission manager with the company. "We've done all the design and testing in-house. We don't outsource." After the launch, Musk spoke to a crowd of employees at the company's headquarters in Hawthorne, Calif.
"We made orbit thanks to the hard of work of SpaceX and all you guys," Musk told the crowd. The rocket initially reached an orbit stretching from a low point of 205 miles to a high point of 404 miles. The orbital inclination was 9.3 degrees. SpaceX released information before the launch indicating that the rocket would target an orbit with an apogee, or high point, of 426 miles. But Musk said the rocket hit an orbit very close to prelaunch predictions. After coasting through space for several minutes, the second stage engine restarted for a brief firing to circularize the orbit at an altitude just shy of 400 miles, according to U.S. military tracking data. "Restarting rocket upper stages is not a trivial matter, so there was definitely a big icing on the cake there," Musk said. "I would have been happy if we just made it to orbit, but the restart was definitely great." Musk, who appeared speechless during his address to workers, said his nervous system had been frazzled by the successful launch. "There are a lot of people that thought we couldn't do it, but as the saying goes, fourth time's the charm," Musk said. The mission logo for the launch, known as Flight 4 in SpaceX parlance, includes two four-leaf clovers symbolizing the end of the rocket's string of bad luck. "The team is elated and ecstatic," Musk said. "It really gives a huge kick in the balls to the naysayers." SpaceX touts the Falcon 1 as the first privately-developed liquid-fueled rocket to successfully reach orbit. "Getting to orbit, that's just a huge milestone," Musk said. "There are only a handful of countries on Earth that have done it. It's normally a country thing, not a company thing." Sunday's mission was in stark contrast to the Falcon 1's first three launches. Those flights were riddled by delays, last-second aborts and marked by failure. The rocket reached the end of a smooth countdown at 7:15 p.m. EDT (2315 GMT) Sunday. The rocket's Merlin 1C engine ramped up to 78,000 pounds of thrust and the black-and-white launcher was cleared for takeoff. 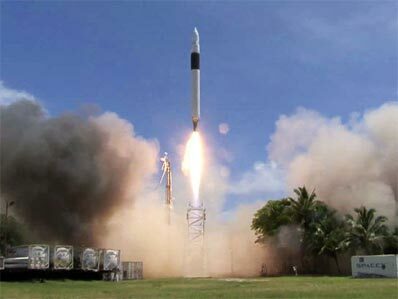 The rocket flew east from the company's middle-of-nowhere launch site on Omelek Island at Kwajalein Atoll in the central Pacific Ocean. The Falcon 1's first stage completed its burn two-and-a-half minutes after liftoff, and the spent booster separated from the rocket's second stage five seconds later. Stage separation was the moment of failure during the Falcon 1's third flight in August, but this time the critical event occurred as planned. SpaceX employees gathered inside the company's massive assembly hangar let out cheers as the second stage Kestrel engine fired and propelled the rocket away from the first stage. The Falcon 1's first stage is designed to be recovered by a team of engineers stationed in the Pacific Ocean downrange from the launch site, but early data analyses indicated the stage from Sunday's launch was likely destroyed as it plunged back into the atmosphere. Musk said engineers did not have enough time to add enough improvements to the first stage thermal protection system to ensure it would survive re-entry. "It most likely did not survive re-entry, but we knew that before liftoff," Musk said. "When it comes to Flight 5, we are going to improve the thermal protection and I think that's going to give us a decent chance of recovering the stage." SpaceX wants to reuse Falcon 1 first stages in the future, but Musk said it may be several flights before that goal becomes viable. Reusability would help drive down the rocket's price to customers, according to Musk. The two halves of the 11.5-foot-tall metal fairing were let go about 30 seconds after second stage ignition, prompting another round of applause from company workers. The Kestrel burned for nearly seven minutes before shutting down once on-board computers detected the rocket had arrived in orbit. The engine's second firing occurred several minutes later. The dummy payload remained attached to the second stage, but the rocket successfully sent a simulated satellite separation command. A Malaysian satellite called RazakSat was originally scheduled to launch on the Falcon 1's fourth mission, but SpaceX pulled the small spacecraft from the launch to make good on a commitment to first complete a successful test flight before launching the payload. RazakSat is now expected to launch on the Falcon 1's next flight. Musk predicted that launch would take off in January or February. Several other customers were interested in putting their satellites on Sunday's Falcon 1 launch, but it would have caused a delay of several months to design a new mission. "The cost of time was greater than what we would have received in payment for the flight, so it was better to fly with a mass simulator sooner," Musk said. Engineers built the six-sided mock satellite to simulate the mass of future Falcon 1 payloads. "Somebody came up with a stylized rat logo and put the sticker on the mass simulator, so it was called Ratsat," Musk said. "Ratsat will be up there for a while," Musk said. "I think somewhere around five or 10 years for the orbit that it's in right now. Maybe we'll go up there and get it with Dragon one day." Dragon is the spacecraft the company proposes to haul cargo to the international space station between the 2010 retirement of the space shuttle and the introduction of the Orion spacecraft in about 2015. SpaceX and Orbital Sciences Corp. are designing cargo delivery systems under a NASA agreement that provides some public funding when the companies reach certain milestones. Officials immediately heralded Sunday's successful launch as a key milestone in the company's mission to reduce the cost of space transportation. "This is really just the beginning," Vozoff said. "It's just the tip of the iceberg." Priced at $7.9 million per flight, the Falcon 1 is more than three times less expensive than other U.S. competitors in the commercial launch market, according to Musk. "If you're (proposing) a mission and suddenly you're getting something at a quarter of the cost, it makes missions feasible that would have never been feasible before," Musk said. The SpaceX founder claimed his company's launch prices are lower than any other rocket in the world, including Russian, Chinese and Indian vehicles. "SpaceX brings the United States to the point of being the most competitive in the world as far as launch is concerned," Musk said. "So instead of just getting the leftovers in terms of launch business, we'll get the lion's share of the world's launch market." Musk said the smooth flight bodes well for the company's heavy-lift Falcon 9 rocket, which is scheduled to debut early next year. "We've shown we can get to orbit and we're going to do that repeatedly now," Musk said. "I think what we've shown is that we've eliminated any design errors with the vehicle." Musk described the major anomalies in the first three launches as design problems. The issues included a corroded nut, sloshing liquid oxygen in the second stage and a slower-than-expected first stage shutdown sequence. "I think it's possible for us to have an unbroken success record now that design issues are taken care of with Falcon 1," Musk said. Musk said current and prospective customers were excited about Sunday's mission. "Getting to orbit is going to unlock a very large number of launch contracts," Musk said. "A lot of Falcon 9 contracts that were in negotiations were predicated on just getting Falcon 1 to orbit."